A girl placed with Muslim foster carers in a case that ignited a media storm had a “warm relationship” with the family and wants to see them again, an internal council investigation has found. In August, claims that the five-year-old, who was described as a “white Christian”, had been left distressed after being placed in a Muslim household became the focus of a political and media furore. The row surrounding child AB, as she is known in court documents, was prompted by a front-page article in the Times headlined “Christian child forced into Muslim foster care”. The girl was then moved into her maternal grandmother’s care, who it later emerged was herself a non-practising Muslim and intended to take the girl back to their country of origin if given custody of the child. A hearing at East London family court on Monday heard that a subsequent inquiry by Tower Hamlets council into allegations aired in the Times against the foster carers found they had provided “warm and appropriate” care to the girl. The girl’s mother, who is fighting for custody of the child, disputes the findings. After interviewing the maternal grandmother, a social worker and the child, the inquiry discovered that the girl missed one of the foster carers. The judge, Khatun Sapnara, reading extracts from the Tower Hamlets report, said the findings were a “very interesting and robust” defence against the allegations raised in the Times. “The maternal grandmother is dismissive of the concerns and upset by them,” the judge said. The child’s maternal grandmother “in fact has a warm relationship with one of the foster carers – as does the child”, she said. The judge added that child AB “misses the foster carer and another child in the same placement”. The report addresses all allegations, makes for “very interesting reading” and provides an “alternative narrative” to that portrayed in the Times, the judge added. The judge has given the authorities until Friday to draw up a redacted version of the report so it can be published. Lawyers for the mother said they objected to its publication and would have to take instruction from their client to appeal against the judge’s decision to publish the report, or apply for a stay of publication. The hearing on Monday also heard that the child was of dual nationality. She was christened but was not taken to church by her mother or anyone else, the court heard. Her maternal grandparents are Muslim and while they do not attend mosque, they do pray at home, the court was told. The girl’s mother has a criminal conviction and is appealing against it. The Times initially reported that, according to confidential local authority reports, a social services supervisor had described the child crying, asking not to be returned to one foster carer because “they don’t speak English”. The report, seized on by far-right activists, included a pixelated photograph of the girl in the company of a woman – alleged to be her foster carer – wearing a black niqab or burka. The Daily Mail followed by putting the story on its front page under the headline “MPs’ anger as Christian girl forced into Muslim foster care”. 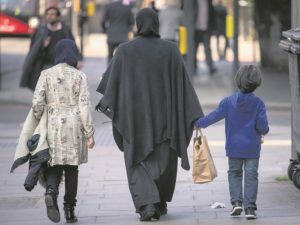 It used a stock picture of a Muslim family to illustrate the story in print and online, but altered the image to cover the woman’s face with a veil. A document released by the judge with details of an earlier hearing revealed that the child’s mother had applied for a Scram bracelet – a tag to monitor levels of alcohol consumption – and her solicitors requested permission to supply results for cocaine testing. The child’s biological father could not be located, the document said. A final hearing on the child’s future will be held in December. To become a ‘Friend of PCC’ we are looking for individuals or organisations to give either a regular donation or a one off gift towards our projects.